I love classic cartoons and TV shows. With the ease of buying DVDs / BluRays, you can enjoy these classics at anytime. 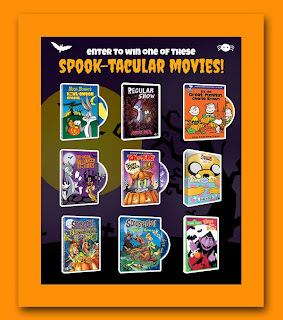 Here is a great assembly of Halloween themed tv shoes and cartoons that Warner Brother's currently has available. Which Spooky Family Are You? QUIZ - Is your family all about the candy and costumes? Or are you pumpkin-carving crazy? Take the quiz to find out which spooky family YOU are! Interested in winning your own frightfully fun DVD? Simply like the Which Spooky Family Are You? QUIZ and post your results in your comments section then fill out the rafflecopter form!. One randomly selected winner will receive a DVD selected by the sponsor. Have fun and good luck to all! Disclosure: Information provided to me by Warner Brothers through a PR firm. I did not receive any compensation for this post. When on a Paleo friendly diet, it can be challenging to come up with new ideas for dinner. One dish that is fairly versatile is lettuce wraps. Simply fill large pieces of lettuce with your choice of toppings and sauce. Roll and eat! Pork, fresh bell pepper, celery, olives and/or almonds and rice vinegar. In a food processor, add tomatoes, tamatillo, hot pepper, seasoning and garlic. Blend until smooth. Add in chopped onions and diced tomatoes. Squeeze in lime and stir. Ready to eat! This is much more watery than store bought salsa but I love it.